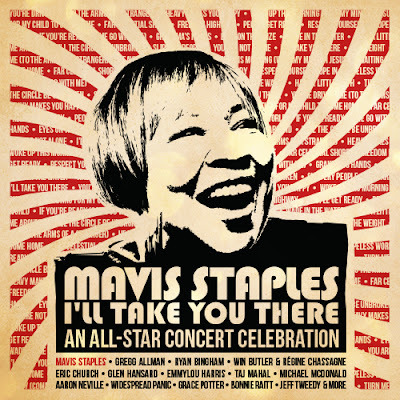 I'm looking forward to seeing the legendary Mavis Staples when she performs at Doheny Blues Festival on May 21, 2017, and then catching the tribute to the artist titled Mavis Staples: I’ll Take You There – An All-Star Concert Celebration coming to CD/DVD on June 2. Eric Church performing "Eyes On The Prize." Mavis Staples: I’ll Take You There – An All-Star Concert Celebration had its worldwide exclusive broadcast premiere as a concert special on AXS TV earlier this month, and the album and DVD combo will be released on June 2, 2017 via Blackbird Presents Records. The concert special includes exclusive interviews with many of the participating artists, exploring Staples’ cultural and musical impact. For more information, visit the Blackbird Presents Records site here. 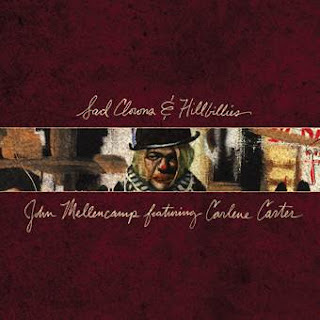 APRIL 28, 2017 NEW YORK, NY: Heartland rocker John Mellencamp releases his 23rd full-length album Sad Clowns & Hillbillies featuring Carlene Carter—the daughter of June Carter Cash and stepdaughter of Johnny Cash—on Republic Records today. Get it HERE. This past week, the Rock and Roll Hall of Famer teamed up with NPR to stream the album early as a NPR “First Listen” where they proclaimed “By the time the album is done…what else you can do but start the damn thing over again?” In addition, he took the stage at Late Night With Seth Meyer for an interview with Meyers where he discussed how Bob Dylan first told him to start selling his now infamous paintings, performed “Grandview” joined by one of country’s biggest voices Martina McBride, and treated audiences to an acoustic rendition of “Jack and Diane.” Check out the interview here, performance of “Grandview” featuring Martina McBride here, and “Jack and Diane” here. Next week, Mellencamp will continue his string of television appearances as he is scheduled to perform on the Today Show on May 3rd and speak with CNN New Day on May 4th. 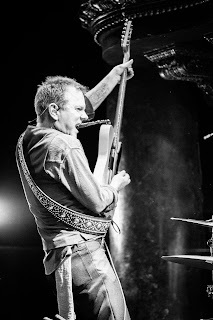 This summer, Mellencamp will tour for 22 stops across North America for his all-new Sad Clowns & Hillbillies tour kicking off on June 5th in Denver, Colorado with special guests, Emmylou Harris, tour-mate Carlene Carter and Lily & Madeleine. Every online ticket purchased comes with one physical CD of Sad Clowns & Hillbillies. See the full tour itinerary and purchase tickets here. Sad Clowns and Hillbillies is the Rock and Roll Hall of Famer’s follow up to 2014’s critically-acclaimed, Plain Spoken, Mellencamp’s fourth consecutive Top 20 album, dating back to 2007’s Freedom Road. John Mellencamp’s career in music, spanning more than 35 years, has seen him transition from pop star to one of the most highly respected singer/songwriters of a generation. Mellencamp is incredibly acclaimed; he is a member of the Rock and Roll Hall of Fame, a Grammy winner, a recipient of the John Steinbeck Award, ASCAP Foundation’s Champion Award, The Woody Guthrie Award and Americana Music Association's Lifetime Achievement Award and more recently, the Founders Award, the top honor assigned by the American Society of Composers, Authors and Publishers. He is also one of the most successful live concert performers in the world. In 1985, Mellencamp, together with Willie Nelson and Neil Young, created Farm Aid. The social activism reflected in his songs helped catalyze Farm Aid, the concert series and organization that has addressed the struggle of American family farmers for more than 25 years. John also wrote the title song for the upcoming film, The Yellow Birds, an American war film directed by Alexandre Moors and based on the novel The Yellow Birds by Kevin Powers. The film stars Tye Sheridan, Jack Huston, Alden Ehrenreich, Jennifer Aniston, and Toni Collette. John continues to focus on another facet of his artistic expression: painting. His style has progressed over the years as evidenced by several gallery shows and published portfolios, and in recent years he has increased his output by completing over 100 new works. His pieces were shown in 2012 at the Tennessee State Museum in Nashville under the title “Nothing Like I Planned: The Art Of John Mellencamp” and, more recently at the Butler Institute of American Art in an exhibition entitled “The Paintings Of John Mellencamp.” “The Paintings of John Mellencamp” traveled to the Museum of Art-DeLand, Florida and John’s art was showcased at the ACA Gallery in New York. The unique instrumentation of his band and his poignant songs about everyday life in the American heartland, are widely credited with being the forbearer of the Americana/No Depression genre of rural-inflected music. An extraordinary collaboration performed by an ensemble cast of 15 actors and a four-piece live band, comprised of members of John Mellencamp’s band is The Ghost Brothers of Darkland County, a musical with music and lyrics by John Mellencamp, a libretto by author Stephen King and production by T Bone Burnett. The show is being further developed in London, though King and Mellencamp are no longer as actively involved. Mellencamp continues his journey as the walking embodiment of heartland rock; passionate, plain-spoken, and a self-proclaimed rebel. John Mellencamp continues to live and work in Bloomington, Indiana. A division of Universal Music Group, the world's leading music company, Republic Records is home to an all-star roster of multi-platinum, award-winning legends and superstar artists such as Aminé, Ariana Grande, Black Sabbath, DNCE, Florence + the Machine, Godsmack, Gotye, Hailee Steinfeld, James Blake, James Bay, John Mellencamp, Julia Michaels, Keith Richards, Kid Cudi, Marian Hill, Of Monsters and Men, Post Malone, Seth MacFarlane, Stevie Wonder, and more. Founded by brothers and chief executives Monte and Avery Lipman, it is also comprised of innovative business ventures, including American Recordings (The Avett Brothers), Brushfire (Jack Johnson), Casablanca Records (Afrojack, Tïesto), Cash Money (Drake, Lil Wayne, Nicki Minaj), Hollywood Records (Sofia Carson, Zendaya), John Varvatos Records, Lava Records (Jessie J, Lorde), Monkeywrench (Pearl Jam), XO (The Weeknd), Roc Nation (Belly, Justine Skye, The Dream, T.I. ), among others. Republic also maintains a long-standing strategic alliance with country powerhouse Big Machine Records (Taylor Swift). In addition, Republic has expanded to release high-profile soundtracks for Fifty Shades of Grey, The Hunger Games, Lee Daniels’ STAR, Pitch Perfect, SING, and The Voice (NBC TV), as well as other notable film and television franchises. Blossoms performing at Coachella on April 22, 2017. 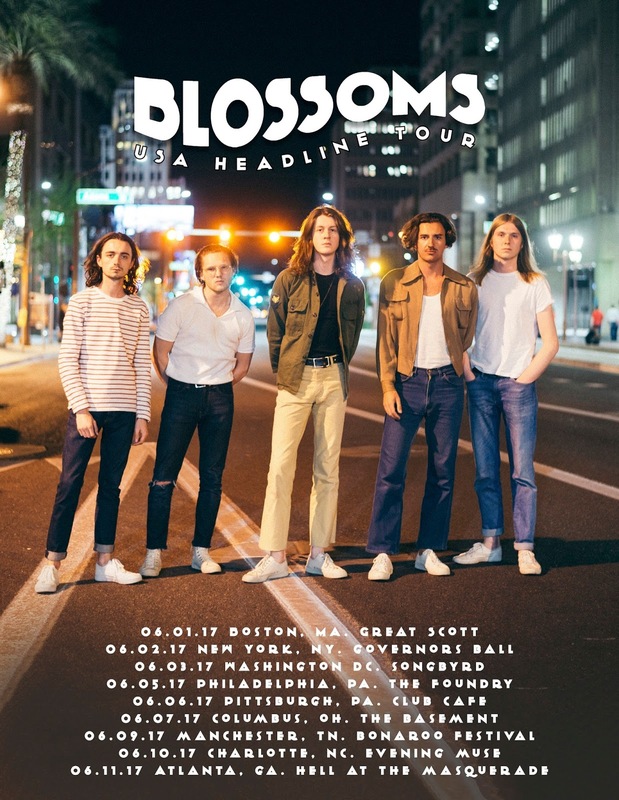 Hot on the heels of their first official headlining tour across North America, bona fide British rock stars Blossoms have announced new U.S. tour dates set to take place this summer. Kicking off June 1st in Boston, this new tour comes right as Tom, Charlie, Josh, Joe and Myles embark on a massive supporting slot, opening for Two Door Cinema Club, not to mention two stellar appearances atCoachella this month. With a Number 1 record under their belt for their self-titled debut album, plus appearances at New York City’s Governors Ball, Manchester’s Bonnaroo Music & Arts Festival and Chicago’s Lollapalooza this year, it is without a doubt that Blossoms will be the Great British breakout band and on everyone’s lips in 2017. Across the Atlantic, the band has just completed their SOLD-OUT headlining tour, playing to more than 30,000 fans across the UK. They’ve also SOLD-OUT their recently announced upcoming 8,000 capacity outdoor headlining show in Manchester this summer. In other news, Blossoms will also be supporting The Stones Roses this summer, opening for them at the legendary Wembley Stadium in London this June. Be sure to catch the band live at any of the following dates and listen to their critically acclaimed debut full-length on iTunes, Apple Music, Spotify, Amazon today. Great news for fans of Chuck Berry (who passed away at the age of 90 on March 18). 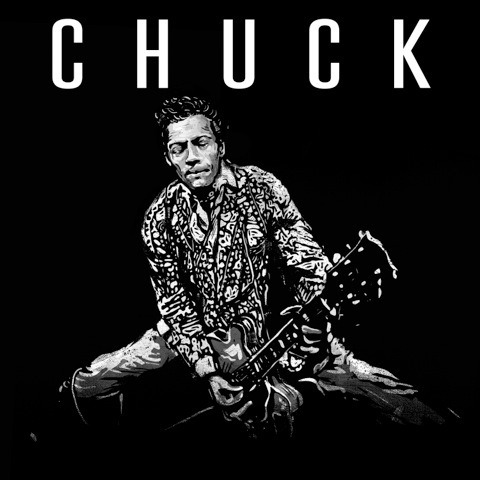 Check out "Wonderful Woman," the second track off the late rock 'n' roll legend's forthcoming and final studio album titled Chuck, set for release via Dualtone Records (an Entertainment One Company) in June 2017. The song was just released today! The fantastic song features Berry (whose vocals sound terrific), as well as his son Charles Jr., his grandson Charles Berry III, and Austin, Texas singer-guitar hero Gary Clark Jr.
Comprised of ten new recordings, eight of which were written by Berry, 'CHUCK' is his first new album since 1979's 'Rock It.' It was recorded and produced by Berry in various studios around St. Louis and features his longtime hometown backing group - including his children Charles Berry Jr. (guitar) and Ingrid Berry (vocals, harmonica), plus Jimmy Marsala (Berry's bassist for forty years), Robert Lohr (piano), and Keith Robinson (drums) - which supported him for nearly two decades on over two hundred residency shows at the famed Blueberry Hill club. 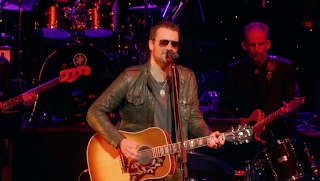 In addition to Gary Clark Jr., the album includes guest performances from Tom Morello, Nathaniel Rateliff, and Chuck's grandson Charles Berry III. Acclaimed author and historian Douglas Brinkley contributes liner notes. Following the release of first single "Big Boys" on March 22nd, early praise began pouring in for 'CHUCK.' Rolling Stone said the album finds Berry "raging against the dying of the light, but in a vulnerable and tender way his earlier music had not prepared us for," while The Guardian raved that 'CHUCK' "proves the late rock'n'roller was brimming with energy until the very end." Uncut remarked that "Berry has as much to say about life and death as Cash and Bowie and Cohen did on their final albums." OAKLAND, Calif.- April 25, 2017 - Pandora (NYSE: P) today announced its partnership with Goldenvoice to host an exclusive audio livestream of performances from the Stagecoach Country Music Festival, taking place April 28-30 at Empire Polo Club in Indio, California. Performances and artists interviews will be available throughout the festival at pandora.com/stagecoachfestival. The station will be co-hosted by Pandora's own country, rock and Americana curators, Rachel Whitney and Eric Shea. "With over 60 million listeners every year, Country fans are one of the biggest, most engaged and loyal audiences on Pandora," said Nick Bartle, chief marketing officer at Pandora. "Partnering with Goldenvoice to livestream one of Country's biggest events allows us to connect our listeners with this year's amazing lineup of talent at Stagecoach for three days of exclusive live performances and content." You can tune in to Pandora's Stagecoach Station now for a road trip playlist inspired by the festival. If you miss the action or want to replay a few of your favorite sets, interactive playlists with select performances will be available from May 5 through June 30. Want to hear even more music from this year's Stagecoach lineup? On Pandora Premium, you can search and play specific tracks or albums from your favorite country artists. Premium is now available to all listeners via the App Store and Google Playor at www.pandora.com/premium. 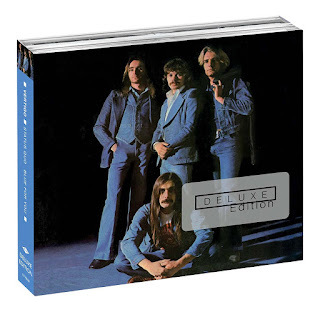 Status Quo are delighted to announce the release of deluxe expanded 2CD / 3CD versions of a trio of classic albums that were released on the revered Vertigo label, namely Blue For You, Just Supposin’ and Never Too Late. These special editions are to be issued by UMe, on May 26, 2017. Offering 36 previously unreleased tracks/versions between them [see track-listing], these carefully curated special releases come with an enhanced booklet containing new notes by Classic Rock’s Dave Ling and also feature rare photos and memorabilia from the band’s personal collection. 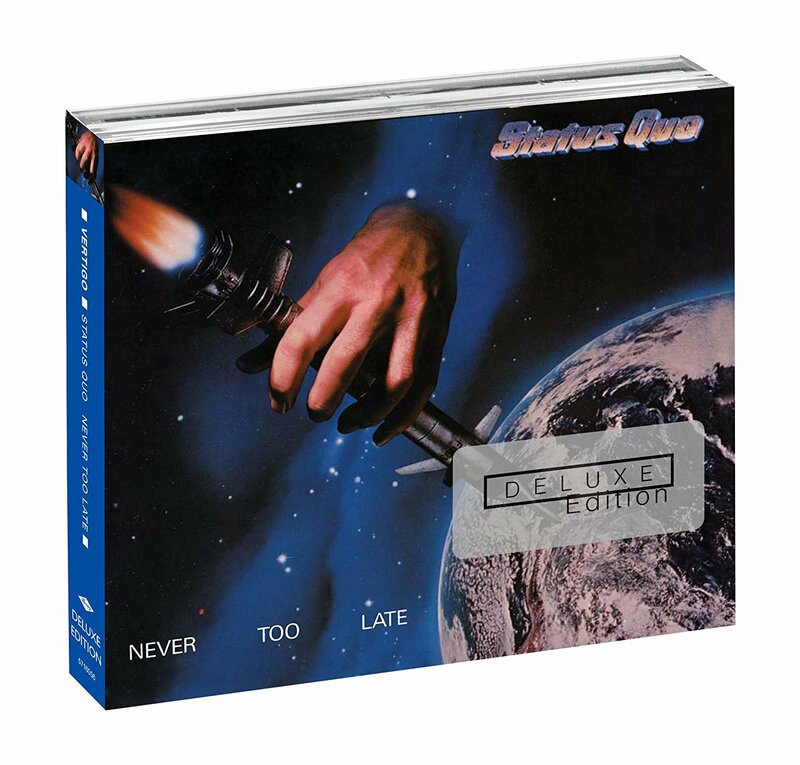 Blue For You was originally released in 1976 and is one of Status Quo’s definitive albums. It was the last to feature the band’s classic 4-piece line up and reached No. 1 in the UK album charts. It contains the classic “Rain” as well as live favorite “Is There A Better Way.” This Deluxe version is released as a 2CD and has been re-mastered by Andy Pearce with the assistance of ‘unofficial 5th band member’ Bob Young from the original tapes and has a bonus disc of demos and live material from the band’s vault. 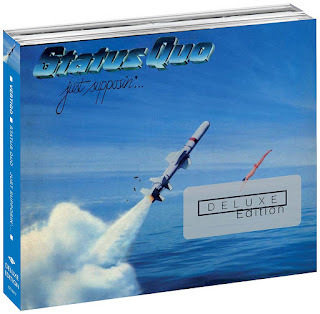 Just Supposin’ is another of Quo’s finest albums – released in 1980 it reached No. 4 in the UK album charts and spawned the singles “What You’re Proposing” and “Rock N Roll.” Again re-mastered by Andy Pearce with Bob Young from original tapes, this 2CD release has a bonus disc of B-Sides and Live recordings. Released in 1981, Never Too Late was the last album to feature drummer John Coghlan and reached No. 2 in the UK LP charts. This 3CD Deluxe edition has been re-mastered by Andy Pearce and Bob Young from the original tapes and has a bonus disc of archive recordings as well as a concert from 1981. These releases are fully supported and endorsed by the band members, past and present – and represent a triumphant revisiting one of the monumental periods of one of the world’s most important rock acts, Status Quo. 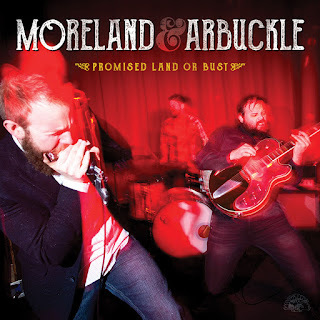 Alligator Records recording artists Moreland & Arbuckle, whose latest album Promised Land Or Bust recently received a 2016 Blues Music Award nomination for Rock Blues Album Of The Year, have decided to amicably dissolve the band. They will play the remaining booked dates on their tour calendar. Guitarist Aaron Moreland plans to spend more time at home with his family. Vocalist, harmonicist and songwriter Dustin Arbuckle plans to continue making music and touring. Drummer Kendall Newby, who joined the band in 2012, also intends to keep playing professionally. Arbuckle says,"The last 15 years have been an incredible ride. I especially want to thank Aaron for being my partner in this endeavor. Creating and playing music with him has been one of the greatest parts of my life. I wish him nothing but happiness in the future. Playing and touring afforded us the opportunity to have so many great experiences and meet even more wonderful people. I want to express my tremendous gratitude to all the friends and fans who have supported us over the years. I plan to continue my career as a touring musician, so hopefully I will see all of them again in the future. In addition, I have to give my most heartfelt thanks to everyone who has been a part of this band and to all those who have helped build it. It's been great and I will always cherish the memories of the good times we've had." Los Angeles, CA - April 26, 2017 - Icelandic rockers Kaleo visited the Late Late Show with James Corden last night to perform their single "No Good" off their critically acclaimed debut album A/B. Led by singer JJ Julius Son, Kaleo delivers a distinctive blend of bluesy alt rock with "otherworldly vocals." (Rolling Stone). To watch Kaleo's performance on the Late Late Show with James Corden, simply see the embedded video at the bottom of this post. Their appearance on Corden comes fresh off the heels of Kaleo's Coachella music festival debut, where the band blew crowds away with a performance that the Huffington Post described as "the secret star" of the festival. Fans will have the opportunity to experience Kaleo live this summer when the band performs at some of the biggest music festivals around the globe including Lollapalooza in both Chicago and Paris and the Bonnaroo Music and Arts Festival in June. Named by Rolling Stone as one of their "10 New Artists You Need To Know," Kaleo's performance on The Late Late Show with James Corden follows a number of major TV appearances including ABC's Jimmy Kimmel Live! as well as NBC's Late Night with Seth Meyers and TBS' Conan. Kaleo's A/B includes the multi-format rock singles, "All The Pretty Girls," "No Good," and the #1 alternative breakthrough "Way Down We Go." "Way Down We Go" marked the band's fourth top 10 hit at three different radio formats in the US. "Way Down We Go" has been certified GOLD in US, Belgium, Ireland and South Africa and platinum in Canada, where it reached #3 on the Alternative radio chart. "The Icelandic foursome begin with a Bon Iver-y hush, then bloom into holy fervor." "The band's dark, spooky ballad 'Way Down We Go' is the perfect showcase of Julius Son's otherworldly vocals." "Kaleo is a mix of Southern influences, from soft and sweet folk songs to blues rock and jagged '70's guitar anthems." "[A/B] stands as a perfect example of Kaleo having universality in good songwriting that works across countries." "...falsetto-fueled balladry meets Icelandic grandiosity." "Kaleo hail from Mosfellsbaer, Iceland, but you wouldn't know it by frontman JJ Julius Son's fine-tuned biker-soul growl or the overheated garage blues on the band's major-label debut." MUSIC WORTH BUYING: "What Happened to the Blues?"